If you are craving a getaway “Under the Tuscan Sun,” Villa Il Palagio in the heart of Tuscany could be just the spot you are looking for. Once a small, family-owned, bio-organic wine estate nestled in Panzano, Chianti, it has become a 30-room inn located within 32 kms (about 20 miles) of Florence, Siena and San Gimignano, and 20 kms (about 12 miles) from Pienza and Montepulciano. Train service is abundant in the region, making for easy daytrips. The swimming pool at Villa Il Palagio in Chianti. Set among vineyard and olive groves, the original, beautifully restored 13th-century villa and surrounding buildings have been divided into comfortable apartments, a wonderful arrangement for a family vacation or reunion in Tuscany. Surrounded by fragrant gardens and panoramic views of the Chianti hills and nearby towns, the property also offers barbeque facilities and working fireplaces in the apartments. Families will appreciate the pool, open mid-May to mid-September in the garden, plus a games room and library. You can stay at the Villa Antica (known to the locals as Villa Altoviti) or in two more recently renovated structures — the Limonaia or the Fienile — former farmhouses restored to maintain tradition. Within them are three different types of apartments. 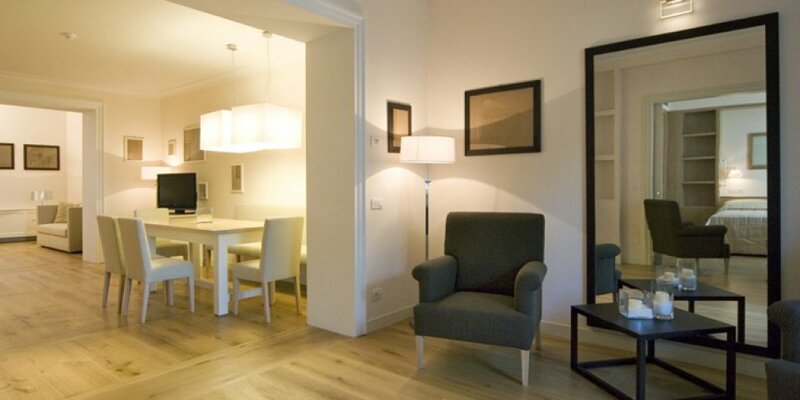 Comfortable family apartment at Villa Il Palagio in Chianti. Stylish with contemporary sleekdecor, the non-smoking apartments have been renovated with all modern comforts and include full kitchens with dishwasher, large living rooms and bedrooms, modern bathrooms, satellite TV, WiFi and balconies or access to the gardens. To make it even more convenient, book the “hotel option” which includes daily breakfast for all plus daily housekeeping. Il Palagio is open year round, although April through October are the high season. Contingent on travel dates, accommodations start from 130 Euros per night for a family of four without breakfast, with bigger discounts for weeklong stays. Rates are very reasonable but beware, we have heard reports of broken air-conditioning which can be very tough when Italy suddenly warms up. Do call ahead to check. Nestled in the Conca d’Oro, the “Golden Basin” of Panzano, the Palagio estate used to grow wine grapes for the finest Chianti Classico as well the fruity EVOO Il Palagio, an extra-virgin olive oil. Today, guests can dine at Palagio59, the hotel restaurant on the patio, and enjoy regional and national Italian dishes in a true farm to fork environment. Thank you for this spot-on mini-review of Greve and Panzano, two of the most scenic and charming towns in Chianti. Daniel Ferro's summer music program only adds to the area's beauty, with music in the piazza to entertain locals and visitors alike. The rental property sounds like an excellent choice for families who choose to vacation in and explore the area. Thanks for sharing!